The Kershaw pocket knives are made in Portland Oregon since 1974. They are among the most popular and innovative in the industry. Legendary for arriving "shaving sharp," Kershaw products are respected worldwide. Solid materials and a superior production process ensure that your Kershaw knife gives you long term pleasure. Ken Onion Products Kershaw offers a variety of folding knives featuring Ken Onion's patent pending "Speed Safe" mechanism incorporating torsion bar technology for assisted opening, whereby the knife can be unfolded very quickly in a safe and authorised way. These open at an accelerated rate once started. They are not considered "automatic openers" and are legal in most jurisdictions. The knives are suitable for outdoor activities and outdoor sports like fishing. Kershaw is also known for the speed safe opening. SLIM, SHARP, AND SIMPLY MUST-HAVEEven if you’ve never carried a knife with you every day, the Skylin..
SLEEK, LIGHTWEIGHT MODELS OFFER KERSHAW QUALITY AT AN AFFORDABLE PRICE.The missing link—between a qu..
2017 BLADE SHOW WINNER—BEST BUYThe success of Kershaw’s made-in-the-USA Link series has yielded a Di..
FEEL THE ATTRACTIONIn Physics, “induction” is the production of a magnetic state due to the proximit.. BITS + A BIG BLADEMost multi-tools include a plethora of “tools,” many of which are not actually ver.. MIX IT UP WITH THE BRAWLERThe Brawler starts with a modified tanto blade—a shape often found in tact..
Kershaw's Vedder offers distinctive looks and top function.On the style side of the equation, the Ve..
CLEAN LINE, COOL PERFORMANCEThe Chill offers you amazing value in a slim, lightweight, and inexpensi..
CLASS AND CONVENIENCEDesigned by Les George, the Westin’s long, lean lines make it a good-looking ca.. This Boot Knife's Mission is to Offer Both Performance and ValueThe model number of our Secret Age.. 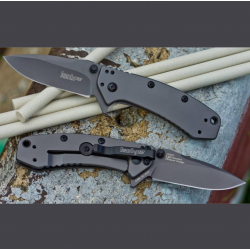 WINNER OF THE 2014 BLADE SHOW'S BEST BUY AWARDKershaw Knives and Emerson Knives have joined forces o..
A TACTICAL TANTO DESIGNED BY EMERSON, BUILT BY KERSHAWKershaw Knives and Emerson Knives have joined .. CARBON FIBER CLASSThis uptown Natrix features blue-gray G10 handles with a classy carbon-fiber overl.. THE POPULAR SHUFFLE—NOW IN BASIC BLACKThe Kershaw Shuffle has proven so popular that we’re introduci..
A BIGGER, BRAWNIER SHUFFLEThe new Shuffle II offers a bigger blade and longer handle, but with the s..